A moment of impact – never realized at the time, but these moments have a way of defining the future. In the late 1800s to early 1900s the thought of revolutionizing manufacturing and shipping processes was obscure. The industrial revolution brought cars made in one-sixth of the time it used to take initiating a moment of impact. Manufacturing processes have since continued to be optimized and supply chain innovation has come a long way since its development in the 1980s. So what moment of impact links the revolution of the manufacturing process ultimately to the supply chain? The founder of a major automobile manufacturing company back in 1913 may be who we tip our hat to. Henry Ford may have not invented the first automobile, but he certainly is credited for revolutionizing the manufacturing process still used today. The moving assembly line, which was influenced by Model N workers who would arrange all the parts on the ground onto skids and drag them down the line, reduced car manufacturing from more than 12 hours down to two and a half hours. Ford broke the Model T’s assembly into 84 discrete steps and trained his workers in just one area of assembly. Never has a thought like the assembly line been formed, but Ford credits the continuous-flow production used in flour mills, breweries, canneries and industrial bakers. And in 1914, almost one year after implementing the assembly line, Ford added a mechanized belt that chugged along at a speed of six feet per minute. The moving assembly line was deemed an innovation that changed the world. It reduced the cost, time and manpower needed to produce cars, and it dropped the model T significantly from $850 to $300. For the first time quality vehicles were available to the masses and on June 4, 1924, the ten-millionth Model T automobile was created. Ford’s approach spread to other automakers, manufacturers of phonographs, vacuum cleaners, refrigerators and other consumer goods. More innovations like just-in-time inventory and time quality management helped make today’s automotive manufacturers the model of efficiency. How? Repeatable, standardized processes that are universal to any make, or model of the automobile. “The assembly line became the characteristic American mode of production.” – Bob Casey, former curator of transportation at The Henry Ford. The 1940s and 1950s brought the challenge of improving very labor-intensive processes of material management. The need to continue to innovate the manufacturing and distribution processes was prominent. The goal was to use racking, and better warehouse design and management. By the 1960s, the trend of time-dependent freight transportation to truck rather than railway evolved for higher efficiency. The 1960s also brought the end to an era with regards to computers. Prior to then, virtually all transactions and record keeping were done manually. The computerization of this data broke ground to marvelous innovations in logistics planning, from randomized storage in warehouses to optimization of inventory and truck routing. The late 1970s to early 1980s created many different types of material handling research centers that focused on a different aspect of what this new technology made possible. The 1980s sparked a boom for logistics. Personal computers provided better access to planners and a new graphical environment for planning like spreadsheets and map-based interfaces. Logistics management had begun to get tremendous recognition from the industry for being expensive, very important and very complex. Executives became aware of logistics when they heard it could improve their bottom line, but only if they were willing to invest. The concept of the supply change earned global recognition in the 1990s. The focus of globalization emphasized the need for logistic strategies to deal with complex networks. Strategies including multiple entries spanning from multiple countries with diverse control. The 90s brought life to Enterprise Resource Planning systems or ERP, a spin-off from material requirements planning systems. ERP systems integrated better with the multiple databases that existed, and was a tremendous improvement in data availability and accuracy. One hundred and five years after the biggest revelation that changed manufacturing, the supply chain is still improving. Systems are becoming more integrated with software. Processes are becoming more integrated with people. 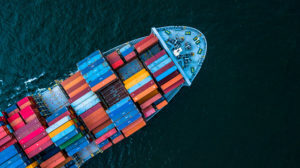 The growing demand from consumers has forced companies to adapt their shipping strategies, lest they shut their doors permanently. The end goal is getting goods out to customers as swiftly as possible to keep them satisfied. Henry Ford acknowledged that need in the early 1900s and his method is still being used to this day. Granted its changed quite a bit to having robots perform much of the work, but that’s the impact of innovation. Same thing goes for supply chain innovation. The growth from manual order entry to computerization of data changed the face of supply chains. Systems for B2B shipping have become more efficient allowing for faster transaction rates for manufacturers and distributors. We have the ability to now pick certain products to pack instead of having to ship entire pallets of one single product. Having a database that automatically updates and prints accurate GS1-128/B–10 PDF417 labels detailing every item in the container allows your business to stay ahead of the competition. Our software allows you to scan to pack, scan to print and scan to verify. ComplyLink puts all the required information on one label for fast and convenient order management.